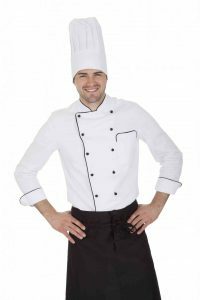 3 Helpful Tips for Maintaining Your Chef Uniform | Ace Uniform Services, Inc.
No matter where you work, you need to make sure that your chef uniform is well taken care of; after all, if the customer wants to send you their compliments, you will want to make sure you look crisp, clean, and professional. Working as a chef can be a messy job. No matter where you work, you need to make sure that your chef uniform is well taken care of; after all, if the customer wants to send you their compliments, you will want to make sure you look crisp, clean, and professional. If you look slovenly or untidy, then the customers might be scared off by your appearance, even if the food you are preparing is amazing. Here are some ways you can keep this unfortunate situation from occurring. Ensure you have the best possible chef uniform by choosing higher quality uniform parts. Low-end aprons, jackets, and hats will disintegrate more easily, especially in the intense heat of a busy kitchen. You will also want to be sure that the uniforms can keep you warm when you need to venture into cold storage for cooking tools or additional ingredients that can’t be held at room temperature. Being too cold or too hot can take your mind off your work, making it harder to concentrate and more likely to make a mistake while cooking. You will want every part of your uniform to look good and feel comfortable, and most of all, make sure the material is breathable. No chef wants to keel over due to overheating, especially as spring and summer are coming in this time of year. Reading is fundamental. That’s because the care labels will tell you how you are supposed to launder your chef uniform and clean it up after a long shift. Most chef uniforms can’t be washed at the same time as street clothes can, as they have different care requirements. Following instructions as they are written will help your uniforms last, especially if they are rentals. Spills and stains are going to happen, and it doesn’t matter if you are working in a fast-casual establishment or a food truck that is exploding in popularity. Treat any stains on your work clothes as soon as you can, because your chef uniform might be harder to clean if the stains are allowed to set. Rubbing the stains will only make them worse; instead, try some club soda to life the spots. Get the stain out before your uniform goes in the dryer, or else you run the risk of setting the stain sooner. This entry was posted on Friday, March 15th, 2019	at 10:52 am	. You can follow any responses to this entry through the RSS 2.0	feed. Both comments and pings are currently closed.